What Happens If You Hit Your Golf Ball Out of Bounds? Out of bounds penalties can negatively impact a good round of golf very quickly. It is a sickening feeling: You stand on the tee, hit one of your longest tee shots of the day … and it goes out of bounds. Often simply referred to as being “OB,” out-of-bounds shots carry a stiff penalty that really hurts your score; however, you can incur even more penalty strokes by taking your OB penalty incorrectly. According to the USGA, out of bounds is defined as “beyond the boundaries of the course or any part of the course so marked.” This boundary is marked by white stakes (and lines connecting them) that are considered “fixed,” which means players are not allowed to move them. A player can stand out of bounds to hit a ball that is still in bounds, but cannot move the stake if it is in the way. A ball is OB only if the entire ball is OB. The penalty for OB is commonly called “stroke and distance.” This means that a one-stroke penalty is added to the score, and the ball must then be dropped as nearly as possible to the spot from which the original shot was played. In effect, this is a two-stroke penalty, since the player has gained no distance from the original shot; it is as if the original shot had never been played at all. Because of this, repeated OB shots can add several shots to a player’s score quickly. 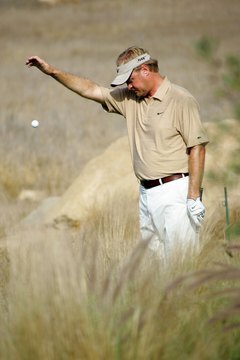 In order to speed up the game, if a player believes that his shot has gone out of bounds, he may tell his playing partners that he is going to play a provisional ball. To do so, once the other members of his group have played their shots, he announces that he is playing a provisional ball and plays another ball from the same spot as his original shot before the group moves on. If his original ball turns out to be OB, he simply picks it up, adds his penalty shots and plays the provisional. If, however, the original ball is in bounds, it is still in play; he plays his original ball without penalty, and just picks up the provisional ball. If a player hits his original ball (first shot) and finds that it has gone OB, he picks up the ball and takes a one-shot penalty (second shot), walks back to the tee, and hits a new tee ball (third shot). Alternatively, if he believes the first ball is OB, he is allowed to hit a provisional ball. If it was indeed OB, the provisional ball becomes his third shot, and he plays his fourth shot from where it landed. In either case, if he finds that the original ball is in bounds, he plays his second shot from there. If the player plays his second shot from the fairway and it goes OB, he adds his one-shot penalty (third shot), drops a ball as close to his second-shot divot as possible, and that becomes his fourth shot. Or, if he is uncertain whether the second shot is in bounds, he may play a provisional ball; if the second shot was OB, his provisional becomes his fourth shot and he plays his fifth shot from where it lies. Either way, if he finds that the original shot remained in bounds, he will play his third shot with that ball. How Does a Drop Work in Golf? How Much Time Is Officially Allowed to Find a Lost Ball When Playing a Hole in Golf? What Does Calling in an Infraction Too Late in Golf Mean? What Is Not Allowed if a Ball Enters a Water Hazard? What Is the Penalty for Hitting Someone Else's Ball in Golf? What Constitutes an Attested Golf Score?